I, TRW (The Retired Wife), have taken a leaf out of TRH’s (The Retired Husband’s) book. I also have done my own mini clearing, cleaning, sorting and re-ordering. In the kitchen. Last night, whilst waiting to pick up our son from the airport, we popped into IKEA. Conveniently, it’s right next to the airport. Yes, I am not ashamed to admit we are flat pack experts. Not just flat pack experts. Experts at navigating our way efficiently and purposefully around the maze that is IKEA. Our renovated kitchen is an IKEA one. And it is brilliant. TRH: It’s a cutlery tray. Much better than the framework we have. TRH: This really well made. Bamboo. Me: Let’s change over to these. I was on a mission now. I wanted them. We measured them. And measured our drawers from memory. (Not recommended.) We looked at the various options available. We selected what would work for us. BUT we had no trolley. And there were none upstairs. A bad Ikea moment. Never go upstairs without a trolley if you plan on getting bulky items. Not that we had planned that. Best to always grab a trolley – just in case. Me: We might as well. Look, we got some bags. TRH: Oookay, said with a resigned sigh of reluctance. Me: You found them! It was your idea to start with! We stuffed them in two bags. Just. TRH: No! I can’t carry them like this. I can’t even get a hold of the handles. We’ll get them next time. He is not a good shopper at the best of times. I believe he has a shopping aversion hair trigger that trips – well, like a hair trigger. This is a phenomena I have witnessed many times over the many, many shopping trips we have been on together during our many, many years of marriage. Which is why I tend to avoid them if I can. The duo shopping trips that is. So back they went. I had not a leg to stand on. 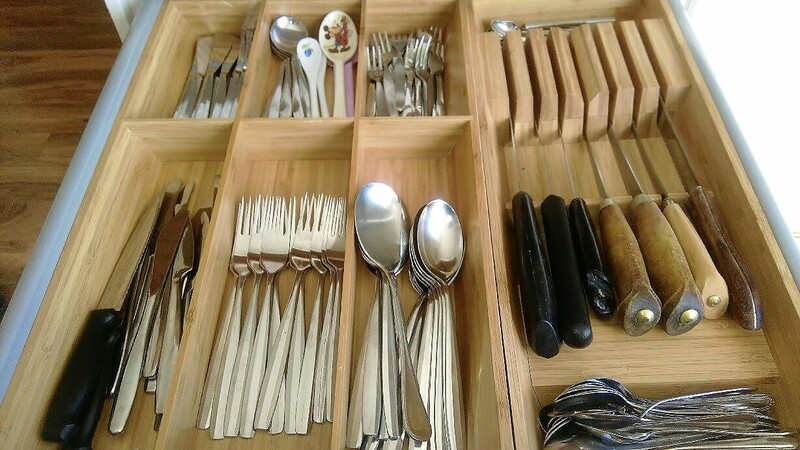 Back at home I looked at the deficient cutlery drawers. They were looking more and more unsatisfactory by the day. I also noticed that they were decidedly narrower than we had remembered. Me: I think we better measure these drawers before we go back. Me: To IKEA. To get those bamboo cutlery trays. Remember? Me: Marc is coming home for Easter. We have to pick him up at the airport on Thursday night. We can go to IKEA then. Just leave early enough so we can eat there first, then get the trays while we wait for his plane to land. TRH: I can make them you know. Just as good. Me: I know. But they would be fiddly and take you a long time. I would rather you put your energies into some other jobs. That was not the end of it. There were several more half hearted attempts to discuss the making of them. On Thursday night we went to Ikea. Our routine is well set now. We have been there so often, we know our way around almost blindfold. We had dinner first. TRH the usual meatballs and mash. TRW fish and chips for a change. Then we hit the hallowed halls. I had a trolley. We weaved our way around. We knew exactly what we wanted. Me: No.The kitchen stuff is up here. TRH: I’m sure it was in the Marketplace. Me: No! striding purposefully ahead whilst skillfully avoiding dawdling Ikea novices with babies in prams. Me: See? There they are ! having arrived in the kitchen fittings area. On the way out we picked up a few packets of frozen meatballs from the Food Hall. Another tradition. I do have a theory about this worrying IKEA memory lapse. There is obviously an associated trauma which prevents the laying down of important IKEA shopping neural pathways. I suspect it is only to be found in the male of the species. This of course is based on anecdotal and experiential data. As far as I know there has been no rigorous triple blind scientific study conducted on this particular malady. The new trays are perfect. So much better. 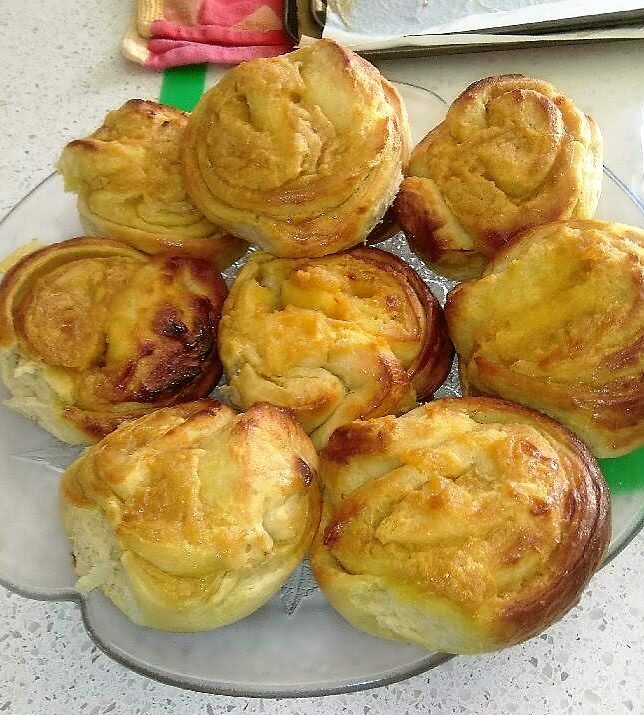 And to celebrate I baked some Dallas pulla – a Finnish sweet bun made from a recipe posted in America. The store design takes you captive. If you do go, take a trolley to the top floor with you or grab one of those yellow bag ones at the top. You’ll find them where all the kitchen fittings are – which is after the display kitchens. 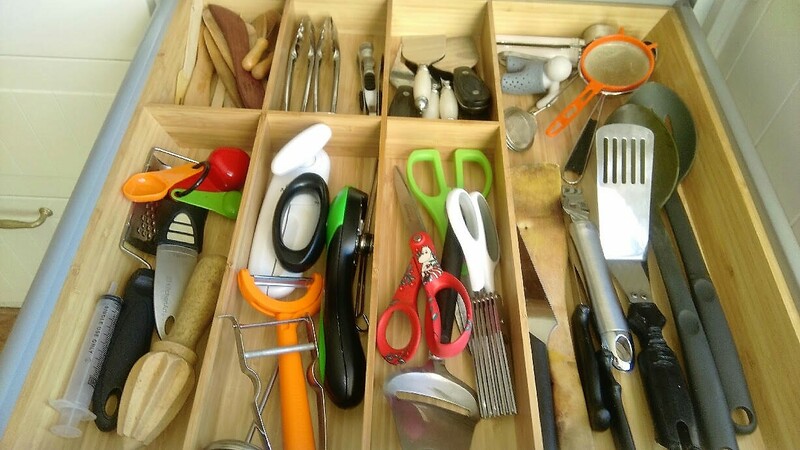 Make sure you measure your drawers.Not sure if all kitchen drawers are a standard size. The trays are made to fit Ikea units. Have fun. I haven’t been to IKEA for ages, Raili, although coincidentally I visited the shop next door to it last night. I could spend hours in there just looking at all their wares and wotnots. It’s fatal when I do go in, however, as I always come out with something. We always come home with more than we planned 🙂 Not a lot this time. I bought some of those clever bag clips. Ikea shopping is a definite art. Know what you mean. It has been designed to force people to walk through the whole store. Clever marketing. And the self serve helps keep prices down. Clever business management. And the cheap meals attract people. Clever advertising. I’m Finnish – they sell a lot of food in the food hall that is very familiar to me. We buy their crispbread, herrings and jams, esp. cloudberry (can’t get it anywhere else) and lingonberry. Yeah – they are really good ! Lol!! My neighbour has fallen in love with them too. Go ahead! Guess! Because they don’t have that plasticky smell – and they hold a lot 🙂 So you getting an IKEA kitchen? We did. . Love it 🙂 The consultant came and spent nearly half a day with us measuring, modeling, quoting. And because we ordered through them we got a refund for the full fee (it was only $150 anyway) and $100 voucher for each thousand spent – paid for the internal fittings. We bought our appliances online. Twenty years back I bought wooden kitchen wall units from Ikea and sawed the backs of them down at an angle to make fitted floor units for my son’s bedroom. It had a ceiling that sloped down, finishing about 45 centimeters from the floor. They pushed up against the wall perfectly. I topped them off with timber shelving, so they didn’t look at all as if they belonged in a kitchen. They looked amazing and held loads of stuff. It was cheaper and easier than it would have been to build them from scratch. You’re such a multi-talented and clever woman! Our kitchen is an Ikea one (apart from the appliances). It’s brilliant. TRH said the quality is just the same as the very expensive we had put in 30 years before. He was so impressed with how everything fitted together perfectly. No need to fiddle and faff around trying to make bits fit that should but don’t. We’ve got quite a lot of Ikea furniture. I’ll do a double drool, just for you ! Happily drool for you anytime!